In front of you are reversible tiles representing fruit halves: each player chooses one. Your goal is to collect as many of these tiles as possible by quickly stacking identical fruit faces. Since everyone plays at the same time, you have to observe quickly and well to make the highest pile! 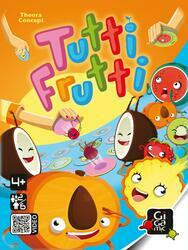 Tutti frutti is an ultra-vitamin game to awaken your reflexes and bring good mood to your table: a fruit cocktail to consume without moderation.